Some 679 days after the final game at White Hart Lane, and six months after the initial September 15 opening date, the first of two official test events were held at the 62,000-seat arena as Spurs' U18 side beat Southampton 3-1. 28,987 lucky fans attended the landmark event, which saw J'Neil Bennett score the first goal at the ground. "We all feel the same, so excited, " he said. 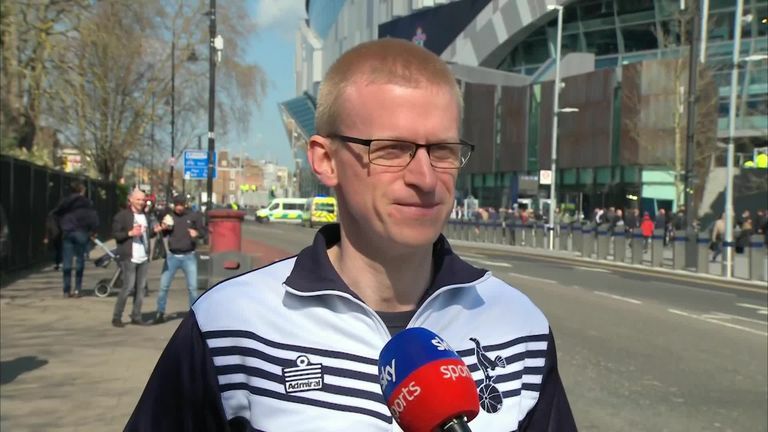 "I got the same feeling when we left White Hart Lane on the last day, we were crying and now in the first day in the new stadium we feel the same emotion. We need to cry because our dream became true." "It was like going home for the 30,000 lucky Spurs fans who flocked to their new stadium and were back at White Hart Lane to see a team in white play for the first time since May 2017. "Many were standing in the sunshine outside simply gawping in awe, their mobile phones and tablets held high. Some even said they were shaking. Others spoke of their emotion. One was nearly in tears afterwards. All spoke of their pride and that, with a 62,000 capacity, Spurs' new home is bigger than Arsenal's. "Inside, the stadium itself is incredible and now the second biggest Premier League venue. The sweeping curves are spectacular and pleasing on the eye. "The high and tight steep stands are surely what a proper football stadium should be. There are echoes of the old White Hart Lane here. "Note to West Ham - this is how it should be done. Chelsea will be green with envy. The NFL will be drooling too." Jeremy Langdon's tips for ensuring your visit to Tottenham's new stadium is a seamless, enjoyable experience. "The friendliness and the new Spurs fan ambassadors stood out as they helped supporters get in. There were very visible bag searches and lots of security. The onus is on having small and clear bags to speed up access. "Some advice: leave your car and leave your notes - this is a cashless stadium. Forget about bringing anything big and think hard about driving too. The road closure zone around the new stadium makes coming by car even trickier than it was before." These can be found throughout the ground but notably in the 65-metre bar running the entire length of the goal line - The Goal Line Bar - which will be the longest bar in Europe. The stadium also contains a 180-bedroom upscale hotel, while Michel Roux Jr, Chris Galvin and Dipna Anand have been named on the chef line-up for the stadium's Michelin-starred dining experiences. The public square outside the stadium will provide what the club describes as a "focal point for supporters and community", with space for fan-themed events and local events run by the Tottenham Hotspur Foundation. Among the other offerings is a 'Sky Walk' - a unique visitor attraction which will allow fans to climb the exterior of the stadium up to 40 metres high. How to follow Spurs' first game? Spurs host Crystal Palace in their first competitive game in their new stadium - and you can follow it on Sky Sports. It was originally proposed that the stadium would hold 58,000, but the capacity has gradually increased as the plans have evolved. The final capacity was confirmed last year as 62,062 - a considerable increase on White Hart Lane's 36,284. That capacity includes a single-tier 'Kop' style stand which contains 17,500 seats. The idea is that it will be reminiscent of Borussia Dortmund's 'Yellow Wall' which has helped the German side generate one of the best matchday atmospheres in Europe. The distance between the single tier and the goal line is just five metres - meaning fans will be closer to the action than at any other newly developed Premier League stadium. With its overall capacity of 62,062, Tottenham's new stadium will be the second-largest club ground in England - behind only Manchester United's Old Trafford, which currently holds 74,994. Tottenham's new home beats the Emirates Stadium, which holds 60,260, and also West Ham's London Stadium, which is currently capped at 60,000. Planning permission was submitted in 2009 but it wasn't until 2015 that the various hurdles were cleared and construction could finally begin. The new arena will be temporarily known as 'Tottenham Hotspur Stadium', with the intention being to sell the naming rights to the stadium in due course. The grass football pitch at the stadium will be retractable and sit above an artificial surface which will be used for NFL games - as well as concerts and other events. The stadium will be the first of its kind in the United Kingdom to have two pitches inside the same bowl.